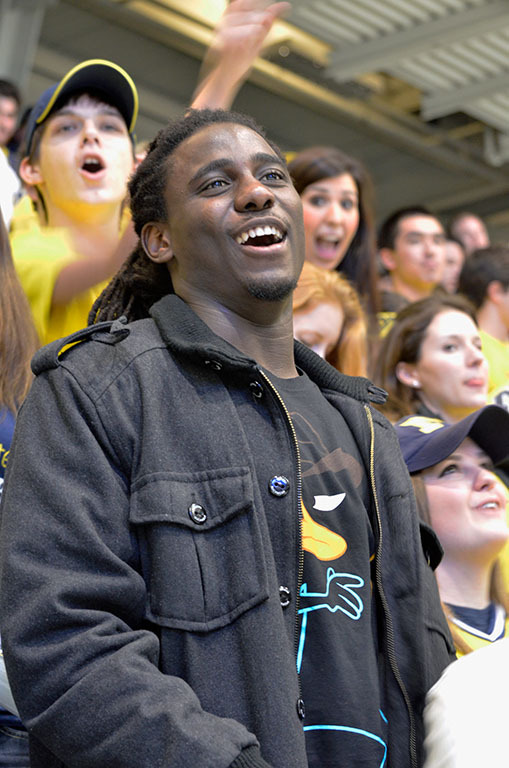 It's a big game when Denard is in the house! The birthday boys stepped up in a big way for the Wolverines last night. Chris Brown and Jon Merrill both turned a year older on Friday, and today is AJ Treais's birthday. Those three players combined for 3 goals and 2 assists as Michigan drew ever-closer to getting back into the race for a CCHA crown by downing the Miami RedHawks 4-1. Michigan got on top early, used a strong first period to build a three-goal lead, and never appeared to be in any danger of relinquishing it, outside of a 1 1/2 minute span in the early second period. Shawn Hunwick stopped 24 of 25 shots and the special teams were fantastic in the victory. Chris Brown got things started 1:40 into the contest. Just moments after Alex Guptill narrowly missed on a goal-mouth pass from Brown, Brown took it himself on a 2-on-1 and beat Cody Reichard 5-hole to give the Wolverines a 1-0 lead. The Children of Yost raised the Texas flag, the band played "Deep in the Heart of Texas" and Yost was rocking! Luke Glendening planted a RedHawk player, won the battle for the puck, and got it over to AJ Treais. He had PDG with him, but ripped a shot past Reichard to make it 2-0. That was a snipe right there. Reilly Smith took a high-sticking penalty and early in the Michigan power play, Will Weber was called for roughing after the whistle. That was an interesting situation. He drilled one of the Wolverines from behind (Wohlberg I think). It could have been five, was certainly two, and it went uncalled. Something happened behind the play, and Weber was given a penalty. From the sound of it, Wohlberg took exception to the hit and there was a scrum? We didn't get a replay of it. Anyway, Blasi was pissed, but if they hadn't missed the original call, we would have had the same result: Long 5-on-3 for Michigan. And the Wolverines capitalized. Treais had the puck in the corner and centered a pass for Luke Moffatt. 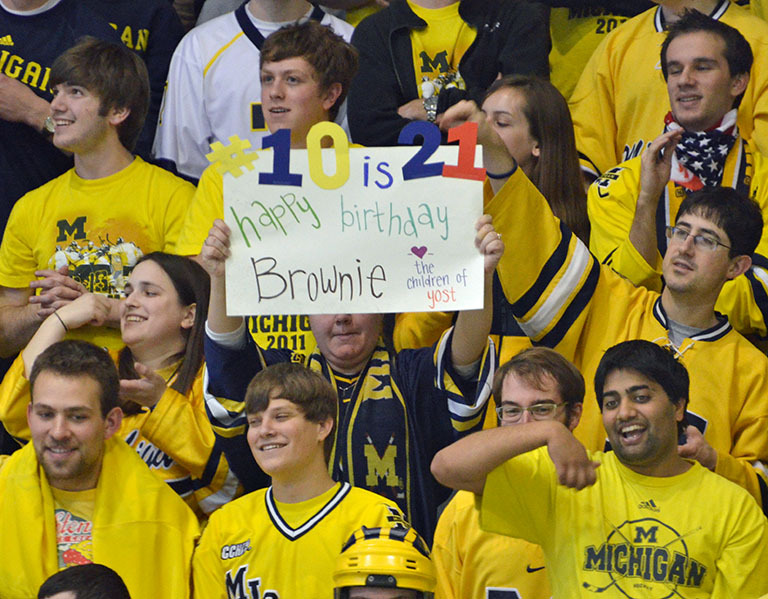 It deflected in and Michigan took a 3-0 lead into the first intermission. 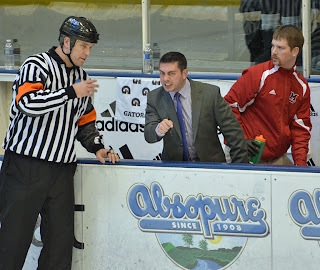 Blasi was pissed. Blasi was less than thrilled with Keith Sergott. Join the crowd. The RedHawks changed goalies after one and came out with Connor Knapp. Early in the second it looked like Miami was going to get back into the game. Their star, Reilly Smith, took a shot that looked like it handcuffed Hunwick a little bit. It found its way into the back of the net and Miami got back within 2 just 30 seconds into the second period. If that was just what the RedHawks needed, they certainly didn't need the too many men on the ice call a minute later. It took the Wolverines just twenty second to capitalize with the man advantage. Jon Merrill took a shot from the point and Luke Moffatt got a gorgeous tip on it. It went up over Knapp and Michigan had their 3-goal lead back. That would be the only shot the Wolverines would put on net in the second period. Miami outshot Michigan 11-1 in the frame, but the goals ended up 1-1. The third period was mainly Miami gooning it up and Michigan getting called for it. Hunwick was run over for the third or fourth time in the game and Pateryn was called for cross-checking. This was the Miami MO: With any contact around the net, take it as an opportunity to plow Hunwick and blame it on the defenseman. It worked, largely because Keith Sergott and Brian Hill are nincompoops. Anyway, the puck don't lie, the penalty killing was terrific, and Michigan kept Miami off the board. With 1.2 seconds left in the contest, Blake Coleman ran over Hunwick yet again. It was at this point that the officials decided to make him pay. Coleman received a five-minute major for charging, which, with 1 second left in the game, they might as well have really sent him a message and given him an eleventy-billion minute penalty. Quite honestly, that was probably the least-severe of all the times Miami ran into Hunwick in the game. You know what would send a message? Call the same thing the first time they do it tonight, and give them a penalty that they actually have to serve. You'll remember that Sergott was the official a few weeks back at Notre Dame, when he let the Irish run Hunwick at every opportunity and usually just evened things up on the rare occasion that he did call anything. He was also the official when Steve Kampfer was attacked by Andrew Conboy and Corey Tropp. He was also the official of the ND/WMU game when the wrong player got ejected. Even if you set the bar for your officials at "Don't endanger players with your incompetence", Sergott fails in a big way. 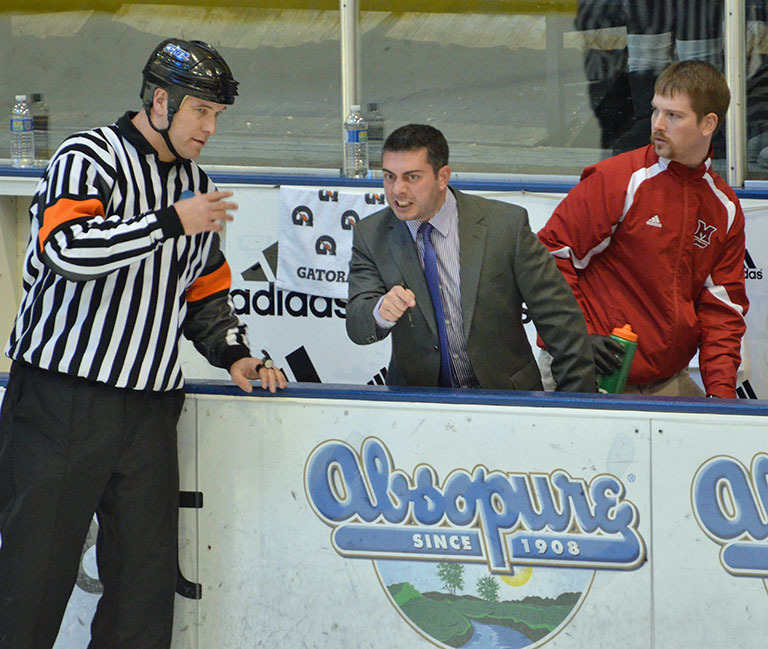 He shouldn't be reffing BGSU/Alabama-Huntsville, let alone high-profile games. Let's talk about the Michigan special teams. Much-maligned for most of this year, both units were special (in the good way) last night. The power-play was two for their first three, and ended the game 2-for-5 with five shots on net. The penalty kill killed off 10:12 of Miami power play time. They did surrender 10 shots on goal, but kept the RedHawks off the board. This was especially crucial during the second period when it was "Get Miami back into the game because Rico is mad" time, and Miami spent 40% of the period with the man-advantage. How big has the return of Merrill been? When Merrill made his return after the GLI, Michigan was 76/95 on the PK (80.0%). They have gone 25/26 (96.1%) since then and are now 23rd in the country at 83.5%. Before Merrill's return, opponents were averaging 2.6 goals per game (57 goals in 22 games). Michigan has given up just 10 goals in the seven games he's been back (1.43 goals per game) and now ranks 10th in team defense (2.31 goals a night). It would be a mistake to give him all the credit for the turnaround, but when you add your best player back into the lineup, it certainly is a boost, and the numbers have shown that. The teams return to the ice tonight at 7:35. The game will air on the CBS Sports Network. 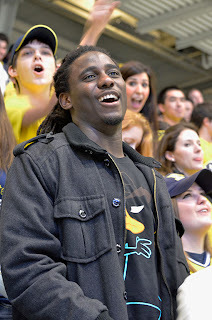 Is Denard wearing a Perry the Platypus shirt? Just when I thought he'd already reached maximum awesomeness. Great post! I agree that the officials were horrendous. Should be a very chippy game tonight. Can't wait!